We will lift your sunken slab of concrete and save you money! Level Best Concrete Lifting, specializes in lifting & stabilizing driveways, steps, sidewalks, patios, basements & garage floors. We also do foundation repair (helical peering) existing & pre-construction, reinforce foundations, foundation leak & crack repair, slab jacking. 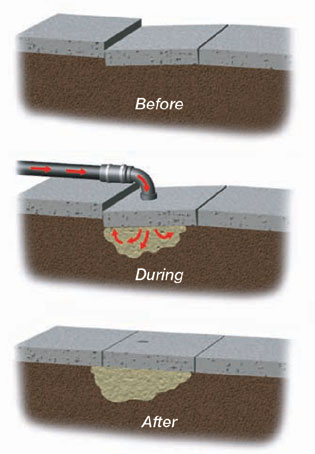 NO WAITING for new concrete to cure (replacement is usually 28 days).﻿﻿ Concrete lifting, sometimes called Mudjacking (or Mud Jacking)﻿ concrete raising, concrete lifting, slabjacking, or concrete stabilization is a straightforward, cost effective and efficient concrete repair process which involves injecting concrete material below sunken concrete slabs. Level Best Concrete Lifting injects a concrete slurry to fill the void beneath the slab, pressurizing, or hydraulically lifting, the slab up to a level position. The process takes just hours to complete so your raised slab can be put back into use just hours after we raise it. Concrete Lifting Reduces Liability and Accidents! Concrete Lifting Saves You Money. It can be walked or driven on almost immediately. Adjacent landscaping and plantings are unaffected. Works great for remote and hard access areas. Reduces down time for business and roads. Controlled lifting to desired grades. Copyright 2011 Level Best Concrete Lifting. All rights reserved.